David grew up on a farm in the interior of BC and he has been backcountry skiing, snowmobiling and mountaineering since he was 6 years old. He learned how to ski, mountaineer and traditional joinery from his father, Jack Bryan who was a master woodworker and and renowned mountaineer with many first ascents in the coast range. Since 2002 he has been a paramedic, and worked the streets of Vancouver as well as rural BC, with close to 10,000 patients attended to. Skiing is his passion and he has completed many classic ski trips in BC including the Pemberton Icefield, Pantheon Range and Bugaboos to Roger's Pass traverse. 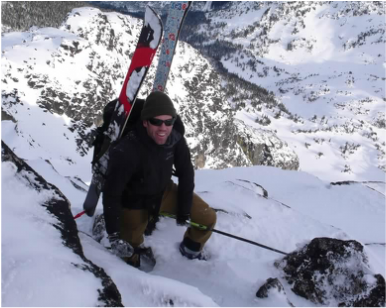 Guiding gives him great satisfaction and he has guided for numerous backcountry ski lodges in the Interior of BC. He volunteers with the local ambulance service and is an active member of Search and Rescue. David is a Canadian Avalanche Association Level 2 Technician, Association of Canadian Mountain Guides, Hiking Guide and licensed Primary Care Paramedic. He lives with his wife Christina and infant son Jack in Haines Junction and tries to ski all year.